Currently employed by property management company, I am seeking a challenging career position utilizing proven strengths which include excellent communication skills and a strong interest and ability in customer service. The primary responsibility of the New Tenant Liaison is to work closely with new residents, build community, maintain communications between management and new residents, and assist in a multitude of administrative tasks. Ensure that the transition process from lease signing to moving in is seamless by scheduling the move in date, print building access cards, issue apartment keys, answer questions about the property, sort out billing discrepancies for the first month, and create work orders to address maintenance issues. Act as primary liaison between new residents, the management office and building trade departments, to resolve apartment maintenance issues by communicating daily via telephone calls and email correspondence. Prepare and maintain several excel and MRI/RDM reports and work orders to generate and track new tenants' building issues. Responsible for early morning blood work and vital signs, and AM care when needed. Assist nurses with new admissions. Restrain patients to prevent violence or injury or to assist physicians or nurses to administer treatments and monitored hallways and made rounds in a lock-down unit.. Responsible for greeting/signing in all patients for a heavy volume group medical practice consisting of 8 internists and 6 specialists. Verify insurance coverage of patient and policyholder. Update records when necessary. Collect and process co-pay and self-pay balances. Prepare charts for new patients and expedite lab, imaging, and consult reports when required for visit. Triage patient appointment requests and schedule visits with appropriate physician. Disburse instructions for office visit preparation per physician's standard orders. Obtained market information via survey of consumer choices. Telephone solicitation of voter preferences. Prepared advertising insertion orders for monthly magazine. 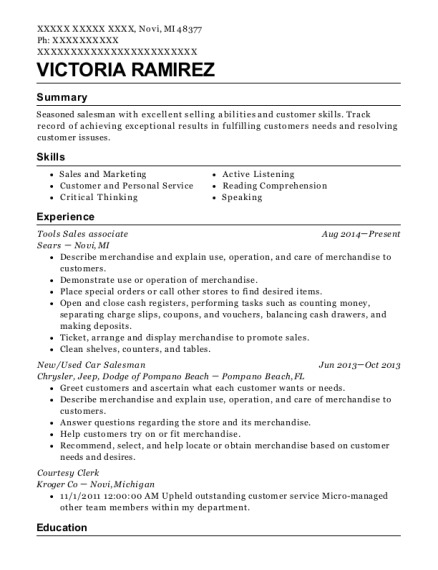 Oversee all inside sales functions. Maintain telephone contact with agents throughout region. Utilize ABLE computerized reservation system daily. 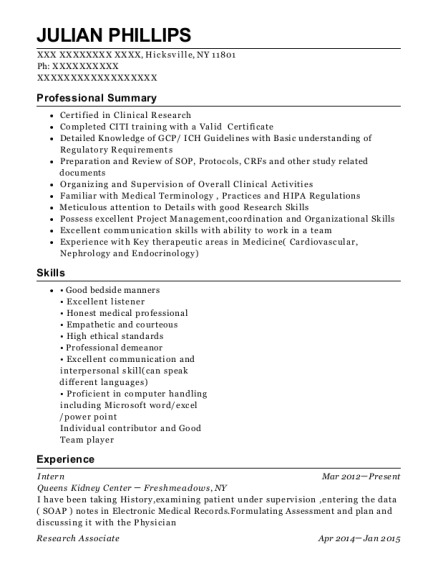 This is a resume for a New Resident Liaison in New York, New York with experience working for such companies as Compass Rock Real Estate and Mt Sinai. 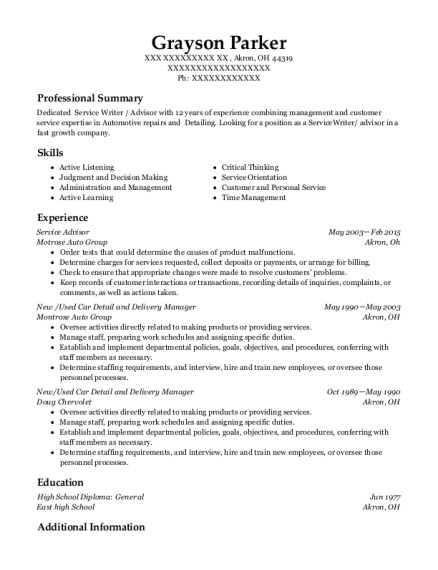 The grade for this resume is 0 and is one of hundreds of New Resident Liaison resumes available on our site for free. 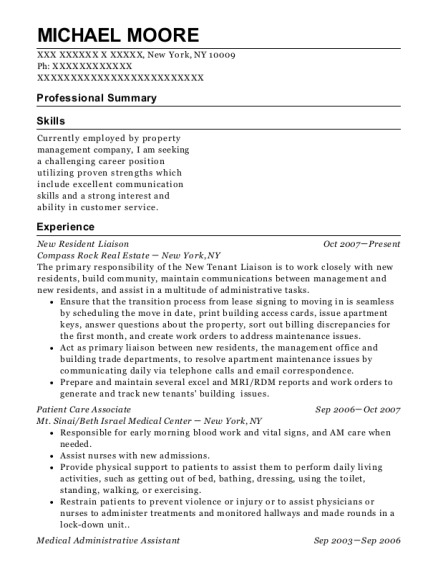 Use these resumes as templates to get help creating the best New Resident Liaison resume.